Originally established as the Buffalo Braves in 1970 then moving west and known as the San Diego Clippers in 1978, the Los Angeles Clippers (where they settled in 1984) are an NBA team playing in the Pacific Division of the Western Conference. They have always been an up-and-down team with decent and terrible seasons going only as far as the second round in the playoffs a handful of times. These past two seasons have been their best, finishing with strong records thanks to the trio of Blake Griffin, Chris Paul, and DeAndre Jordan. Unfortunately, the Clippers are best known recently for its owner’s — Don Sterling — racist remarks, which led to Microsoft’s ex CEO, Steve Ballmer, to purchasing the team in 2014. 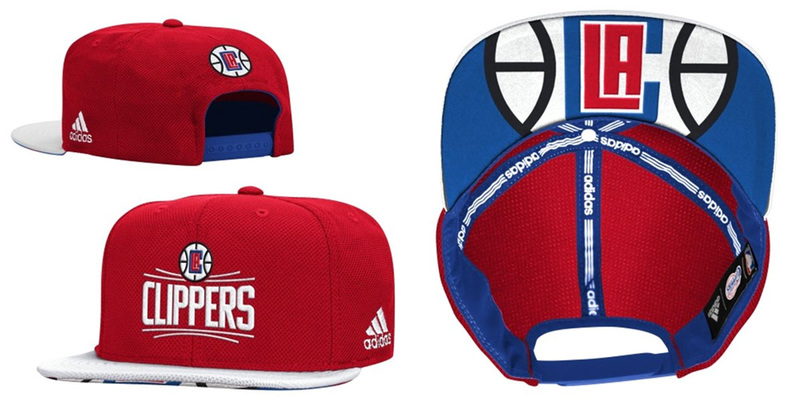 Looking to establish a new era for the Clippers, Ballmer has been very public in the introduction of the team’s new logo (which suffered plenty of of leaks in the past year) and was officially unveiled last week. No design credit given. Logo introduction. Epic in the NBA sort of way. The previous logo was a classic by default, simply because it’s been around for so long. It still has that vintage NBA patina that most teams have lost. It’s not a great logo by any means but it has its good share of nostalgia. (Interlude: The name of the team refers to a kind of very fast ship known as a Clipper.) The new logo is a mash-up of various concepts as seen in the top image, from the horizon of the ocean to the shape of the basketball court; all of them valid, none of them transcendental. They just kind of threw different styles and executions at it to see what stuck and this was it. The best element of the logo is the “CLA” monogram that has the proportion of a basketball court and makes for a cool bit of typography but everything around it is fairly boring and random. 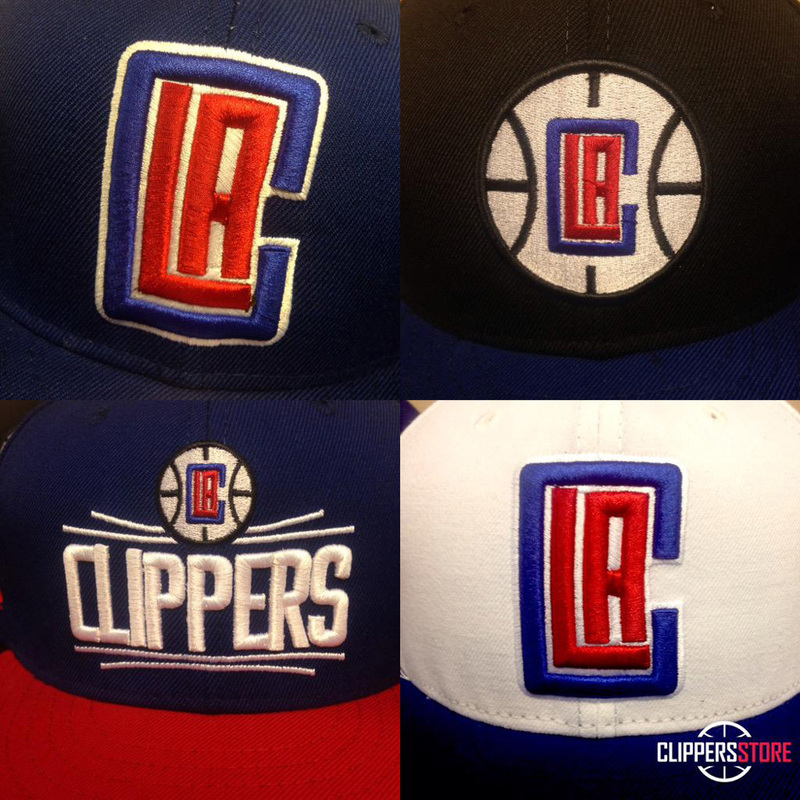 The basketball outline has no graphic relationship with the letters; the red and blue ribbons relate to the thickness of the basketball but their curvature are aleatory; and then the CLIPPERS wordmark is another style altogether with its extra tight letter-spacing and barely there highlight. It’s almost surprising that they stopped at four-or-five elements and didn’t keep going with a script typeface showing the year established. New uniform. (With worst drop shadows ever). 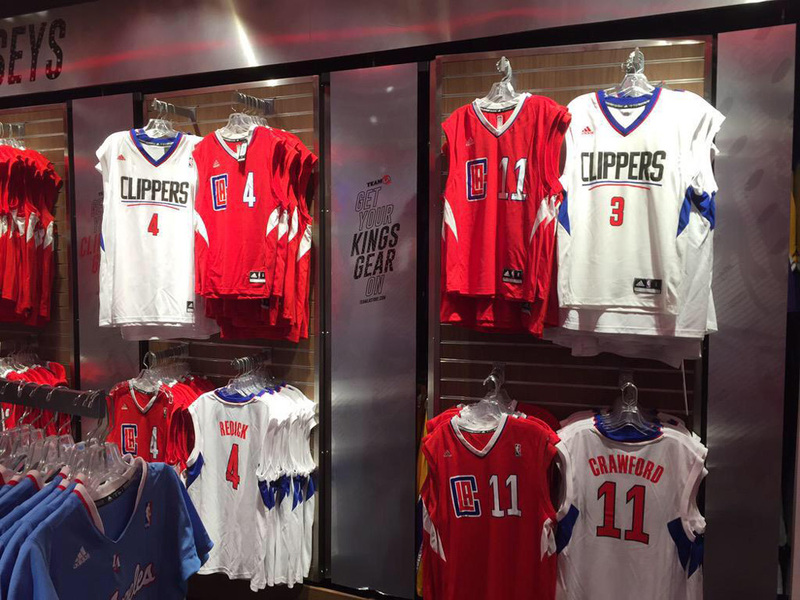 The uniforms on display. (Source). The uniforms aren’t much better and they are also a little confused in what they want to achieve. The white uni is more classic with the centered name and number while the red uni is justified (I guess) with the monogram and large number on the same line. In theory, the latter should be cool, but it’s not really. The caps are kinda cool. 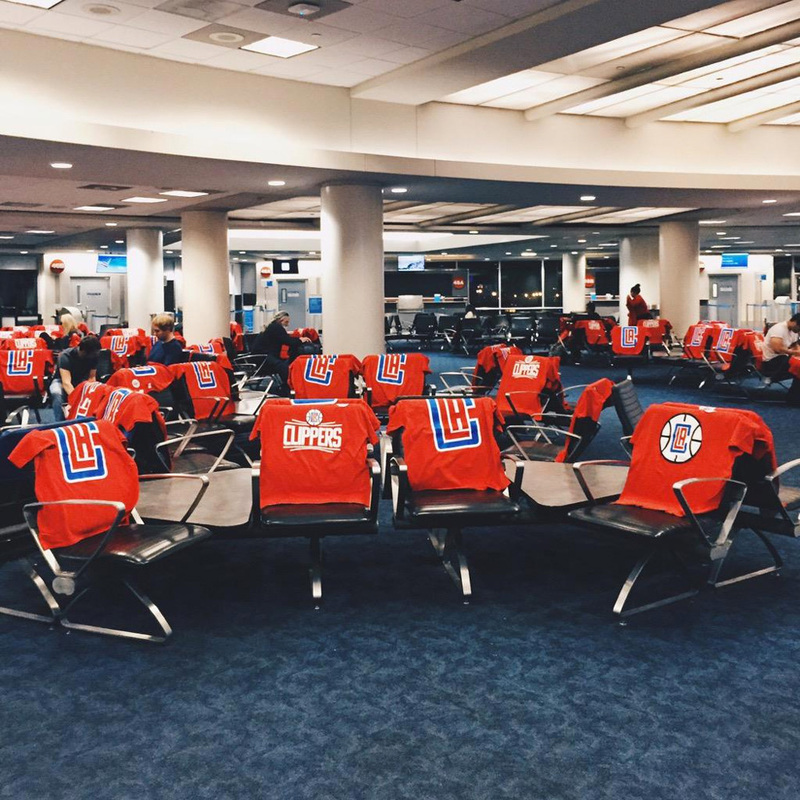 The #GearUpLa campaign, where the team gave out t-shirts and caps all through Los Angeles, including at LAX and an American Airlines flight. Funny or Die logo introduction. 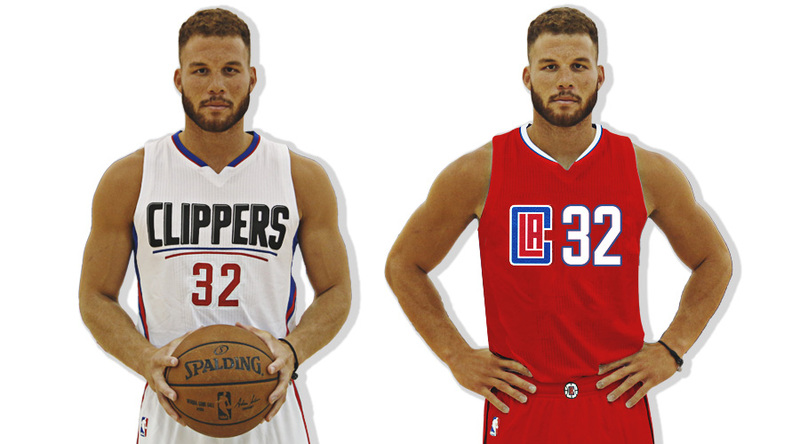 Mostly funny because of Blake Griffin. 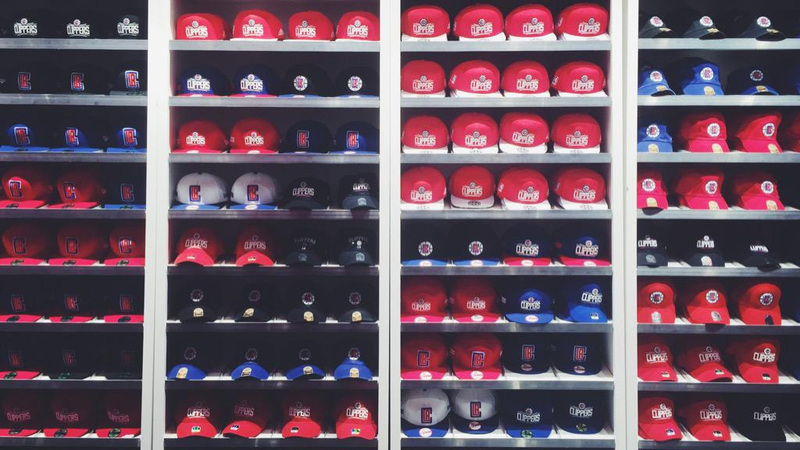 The one aspect where the Clippers get credit is in their effort to get the logo out to the fans and get some positive traction going. 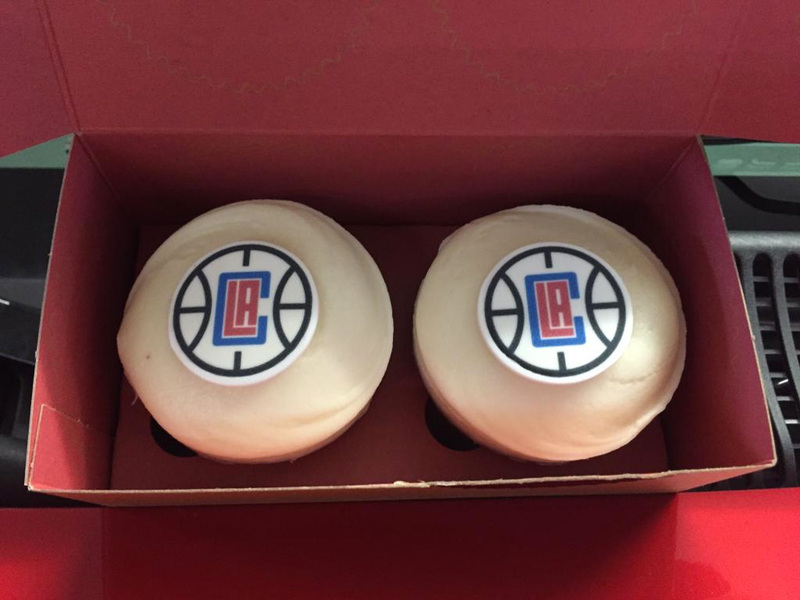 Owner Steve Ballmer went on Conan, did a Funny or Die spot, and was in a few locations throughout LA as the team gave out t-shirts to a bunch of people. It doesn’t make the logo better — especially not at the gigantic size they printed them on the t-shirts — but it makes it part of the city and that’s what makes a sports logo successful: how much it feels as it belongs and embraced by fans. Thanks to Chris Nelson for the tip. Originally established as the Buffalo Braves in 1970 then moving west and known as the San Diego Clippers in 1978, the Los Angeles Clippers (where they settled in 1984) are an NBA team playing in the Pacific Division of the Western Conference. They have always been an up-and-down team with decent and terrible seasons going only as far as the second round in the playoffs a handful of times. These past two seasons have been their best, finishing with strong records thanks to the trio of Blake Griffin, Chris Paul, and DeAndre Jordan. Unfortunately, the Clippers are best known recently for its owner's — Don Sterling — racist remarks, which led to Microsoft's ex CEO, Steve Ballmer, to purchasing the team in 2014. Looking to establish a new era for the Clippers, Ballmer has been very public in the introduction of the team's new logo (which suffered plenty of of leaks in the past year) and was officially unveiled last week. No design credit given.